THE first time Julee-anne Bell performed she was five years old and her dad had to carry her off stage because she wouldn't leave, she loved it. 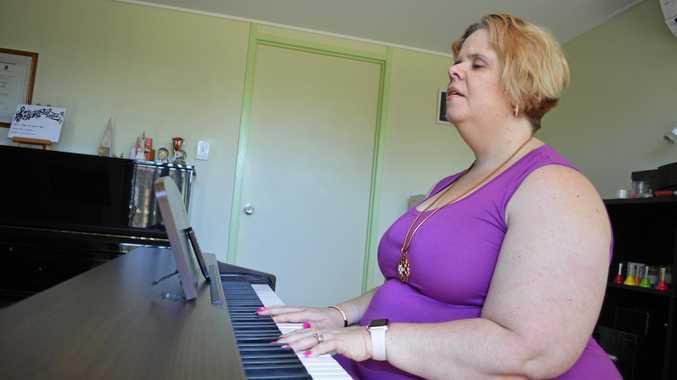 It was her first time singing into a microphone at her School for the Blind concert and now she is giving young kids in the South Burnett the confidence to do the same. Since birth Mrs Bell has never had any vision but she hasn't let it stop her from performing on stage for Opera Queensland and leading school and community choirs as a vocal teacher. "I don't have light perception so I am a little bit rare because most people who are blind can see something even if it is just light but I can't see anything," she said. She is committed to helping young people in the South Burnett find their voice and started travelling from Brisbane in 2016 to help students at Saint Mary Catholic College. Mrs Bell has now made the move to the South Burnett with her husband and will be immersing herself in the community continuing her role at Saint Mary's and becoming the new conductor of South Burnett Chorale and leading programs at SBCare. She recognises that every different teaching circumstance has different challenges. "I love teaching kids because you are moulding them and shaping them and you are also a part of not just their vocal lives but you learn about them and their families," she said. "I think it is a great honour to be an important adult in a child's life and when that happens to me I am humbled by it." Mrs Bell finds that many adults who take up singing in later life have been told by teachers in the past they can't sing, something she would never say to a student. "It may be at that moment in time you have some difficulty with singing but to say someone can't is such a final comment that it closes the door and their is no reason to do that," she said. "My job is to open the door, and sometimes that door is locked and it has got lots of chains on it and people are desperate to get out of the prison they have been put in by that comment." Mrs Bell is proud to be the eighth conductor of South Burnett chorale in the groups 23 year history and will be looking to evolve the group while keeping its tradition. "The chorale will be embracing as many vocal styles as I can possibly manage," she said. "I will be teaching everything from renaissance madrigals right through to contemporary and some jazz. "You don't have to be high brow but you might be able to learn some Mozart in Latin with the right support and you might have this wonderful skill of being able to sing in a different language." Mrs Bell is also looking forward to the opportunity to run small group programs for clients at SBCare as she understands that a choir can be more than a singing group. "I am looking forward to being able to mentor people with varies disabilities and injuries because singing can help people with anxiety and can help people with social inhibition, especially singing in a group," she said. "It can really bring people together and make people feel part of a team and people to have a sense of belonging. "If I can provide that in some small way then I am really happy to do it." The South Burnett chorale will meet for the first time in 2019 at 7pm on Tuesday, January 29 at Church of Christ Hall.